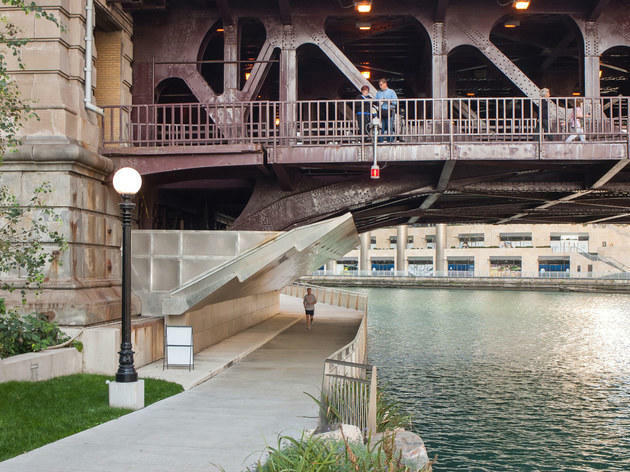 If you're looking for breathtaking views of some of Chicago's most gorgeous architecture, take a stroll along the Riverwalk, which hugs the main branch of the Chicago River and provides a continuous walkway with restaurants, bars and urban attractions at every turn. Clever design features throughout offer areas to lounge around and enjoy the city from a stellar angle. Whether you have out-of-towners in tow or you're just trying to spend some time near the water, the Riverwalk is the perfect place to grab a bite for lunch or dinner. A heavy helping of casual bars doesn't hurt matters either. Start the afternoon with a glass of vino at City Winery, where you'll find a curated selection of by-the-glass pours and small bites, such as burrata, dolmades, cheese plates and cured meats. Cocktail enthusiasts will find refuge at Tiny Tapp & Cafe, where sliders and craft beverages are on tap. When it's time to call it quits, hit up Frost Gelato for a sweet, icy treat. Of course, when you're this close to the river, there are plenty of ways to get your sea legs. Hop on any number of boat cruises to take in the skyline and Chicago's gorgeous architecture from a different vantage point. For a budget-friendly option, grab a seat on the Chicago Water Taxi, which docks at seven different locations around the city, including one at Clark Street along the Riverwalk. But you don't have to spend a dime to really enjoy the Riverwalk. The sprawling urban walkway is dotted with grassy areas, concrete stadium seating and architectural treasures. Plus, you can take in live music at various venues just about every night of the week. Our Chicago editorial team is constantly updating and reviewing the best attractions, activities and venues across the city, so that you're always in the know, with the best of Chicago at your fingertips. Chicago was most recently updated with new tips on June 14, 2017. El stop: Blue, Brown, Green, Orange, Pink, Purple (rush hrs) to Clark/Lake. Bus: 14, 20, 56, 60. YESSSSSSSS. This is my favorite thing about Chicago. You get an awesome view of the city from an interesting perspective. Nothing better than taking a walk in the summer with a group of friends and stopping at Tiny Hat or City winery for a margarita pitcher. I like sitting on that cool stair section and watching the boats go by. Also great spot for a run in the early morning. With such an amazing lakefront, it only made sense that Chicago focused on the river walk next. The river walk expanded a lot at the end of this past summer so it will be a major destination for locals and tourists in the spring. The restaurants shut down over the winter but the walk is still nice to see during the day. I work in river north really enjoy spending lunch on the river walk in warmer weather. It is also nice to walk along to avoid intersections if you need to walk along wacker during rush hour. The Riverwalk has become my favorite place in Chicago especially in the summer. I bring visitors to check the views out as well as the waterfront restaurants and bars. I finally went on the architecture boat tour and I loved it! I highly recommend doing it. I am also excited that the Riverwalk is expanding and becoming more popular. It definitely is one of the best things about the city. 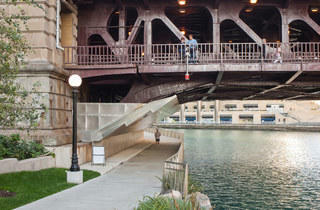 The riverwalk is already becoming the defining location of River North. Despite being out of the open, it's still a bit of a hidden gem that isn't the go-to location for tourists and is the perfect hideaway for the locals. If you can look past it resting in the shadow of the Trump Tower, you'd be hard-pressed to find a better place to bring a packed lunch and escape the hustle and bustle of the workday life in The Loop. Check it out! I’ve spent the last two Memorial Day weekends at the Chicago Riverwalk and it’s been amazing each time. The restaurants are geared toward tourists so they’re on the needlessly pricier side, but you’re paying for the convenience and the beautiful views of downtown Chicago. It connects to the Lakefront Path, and provides easy access to Navy Pier. If you want to take to get into the water, the Riverwalk allows you to take a boat tour of the city, grab a water taxi, or even kayaking in the river. Not many cities have a rivers running through them, and the riverwalk has brought an awesome and unique way to access it. Its awesome to be able to walk and/or eat along the river, and it gives you access to a amazing view of the city from below! One of my favorite parts about Chicago. Many people are so busy that they don't have time to stop and take a stroll on the Riverwalk but it is definitely recommended. Beautiful scenes of great historical buildings, plush landscaping, the Chicago river flowing up and down stream. Grabbing a bite at Chicago steak house or taking in the landscaping & architecture or even cursing on the Mercury Cruise line what a fabulous way to enjoy parts of the great city of Chicago.